The smell of fallen leaves and bonfires filled Dirk Dynamo’s senses, as close to fresh country air as London ever got. Somewhere in the distance, the first fireworks were going off, but here in the heart of the city the crowds were just getting warmed off. He headed off the main thoroughfare and up a well-appointed residential street. Outside Sir Timothy Blaze-Simms’s apartment, something was looming, its bulky body, heavy wheels, and strange projections casting a monstrous shadow in the gaslight. “What is it?” Dirk asked, peering dubiously up at rows of brass tubes. After years of working with Blaze-Simms, Dirk couldn’t pick a single answer. There were just too many options. With a whoosh, the first firework shot skyward, exploding in a dazzling burst of white light. A red one followed, then a blue, then a stream of smaller yellow rockets as the machine accelerated down the street. He looked expectantly at Dirk, who raised an eyebrow. Blaze-Simms dashed after the machine. It had reached the end of the street and headed out into the crowds. People jumped aside to avoid it, laughing and screaming as Catherine wheels spun on its sides. Dirk strolled along behind, keeping the machine in sight. He saw the moment Blaze-Simms leapt onto its back and started prying a hatch open. He saw the burst of steam that blew the inventor’s hat off. He heard his friend cry out in pain and fall back into the crowd. The machine was veering through an increasingly panicked crowd. Dirk had hoped that Blaze-Simms could learn from this one, but he couldn’t let that happen at other people’s expense. The sky blazed with artificial stars as the machine rolled at ever-increasing speed through the city. It hit a lamppost, spun around, smashed into the side of a Hackney carriage, and continued its rampage towards Westminster Bridge. Some people saw the machine in time to leap clear. Others, distracted by its fireworks, were almost crushed as it bore down on them. Dirk caught up just as it thundered onto the bridge. He leapt onto its back, clinging to the towering mass of gunpowder and brass as it headed towards the lights of Parliament. With a crash, the machine hit a chestnut seller’s cart. Hot nuts and blazing coals flew in every direction, some of them falling down the pipes at the front of the machine. A renewed volley of fireworks sprang into the sky. So many launched at once that the machine shook, almost flinging Dirk off. His shoulder blazed with pain as he was hurled to one side and then the other, but he clung on with all of his strength. Hauling himself up, he peered through an open hatch into a mass of gears and pistons. Acting on instinct, he reached inside, ready to yank something out or jam something in, anything to bring it to a halt. But a blast of steam forced him to pull his hand back, skin red raw. The pain was intense. He had to cool the hand down before it got any worse, but first he had to stop this machine. Over the side of the bridge, he saw an answer to both his problems. The problem was, it meant diverting a machine ten times his own weight. Clinging on with his good hand, he flung himself one way and then the other, putting his whole weight into it. His shoulder went from an ache to a raw blazing pain as he became a human pendulum, each swing bigger than the one before. At last, the machine started to sway with him. It tipped up onto just two wheels on one side and then the other. As Dirk flung himself back and to the left, the machine started to turn. They were nearly at the end of the bridge now. A dozen alarmed-looking policemen were rushing to get between the machine and Parliament, but Dirk couldn’t see any way they could stop this. The heart of democracy was about to face the explosive fate Guy Fawkes had once planned, this time at the hands of a well-intentioned eccentric. He swung with all his remaining might. The machine lifted up on one wheel and pivoted around. It clanged back down at ninety degrees to its previous course, hit the side of the bridge with an almighty clang, and tumbled over, taking Dirk with it. As they plunged through the air, Dirk kicked off from the machine. There was a huge splash, then a smaller one as he hit the Thames. The water was filthy, but the cold on his hand came as a sweet relief. He surfaced to see a crowd looking down at him, pointing, gasping, and cheering. Beyond them, Parliament stood proud against the night sky, lit up by fireworks. Dirk turned onto his back and watched the fireworks as he drifted towards the bank. He had to admit, they were spectacular. On the bridge, a figure in a top hat stood awkwardly, waiting to face the consequences of his latest endeavour. Maybe this time he’d remember how these things could go wrong. Dirk wasn’t holding his breath. 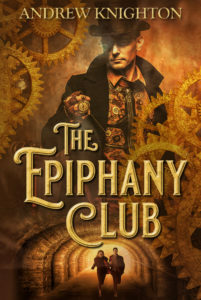 For more of Dirk and Blaze-Simms’s adventures, check out The Epiphany Club, a story of action, adventure, and intrigue set against the dark underbelly of Victorian society, released on the 1st of December. And if you’d like more short stories like this one then you might want to sign up for my mailing list. 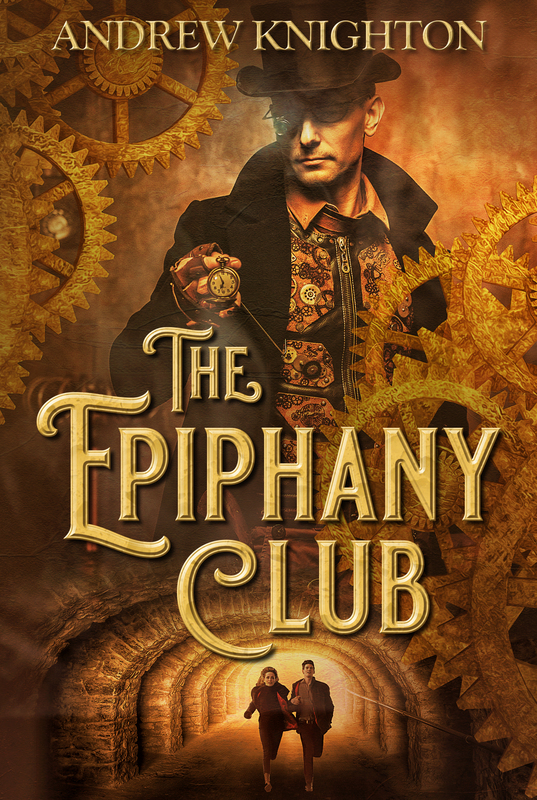 You’ll get free flash fiction straight to your inbox every week, as well as updates on my other releases.